Often, when people think of Renaissance and medieval clothing, they think of battles, kings, queens, and other epic imagery. While it is true that the Renaissance and medieval periods evoke feelings of epic battles, royalty, and luxury, an often overlooked aspect is the romantic look of the outfits, particularly Renaissance gowns. Renaissance gowns conjure nostalgic feelings, even for those of us who have no connection to the era whatsoever. They also contain timeless elements that are still found is evening gowns and dresses today. During the Renaissance era, wearing luxurious Renaissance gowns was often seen as a means todisplay privilege, wealth, and power. Renaissance gowns were often made from thick, color materials, and the more ornamentation affixed to the dress, the wealthier or powerful the woman was. Rich details, such as big sleeves and artistic embroidery, were incorporated into luxurious fabrics like velvet and satin. Perhaps the most influential figures of Renaissance fashion were Henry VIII and Elizabeth I. Elizabeth I was such an avid fashion fan that it is said when she died she had over 3,000 Renaissance gowns and headpieces in her collection. She would embellish her gowns with expensive jewels, embroidery, lace, and ribbons – anything that would give her clothing flair and distinction. There are many portraits of her during her reign as Queen. In them, you can see just how highly detailed and well-appointed her outfits were. While the sheer volume of decoration employed by Elizabeth I may be a little over the top for people of today, there are still ways to capture the romantic look of the Renaissance era. Of course, red is most often associated with romance, so finding a sensual red Renaissance gown is a great start. Our Lady Jane dress and our Lady of Leeds gown are great examples of romantic Renaissance gowns. If you’d like to venture away from a typical red gown, deep purples also imbue the wearer with a romantic look. Our Celtic Lady gown is a perfect example of a sensual dark purple gown. 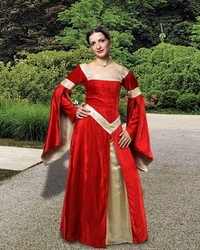 Of course, giving your Renaissance gowns a romantic look isn’t limited to the color. Take into consideration the accessories you choose. Accessories like jewelry or headwear can turn a plain dress into a stunning Renaissance era gown. For more information about Renaissance gowns, take a look at our large selection today!